Did you make New Year’s Resolutions for 2017? How are they coming along? If you’re like most people, even if you’re doing awesome with your New Year’s Resolutions, you’ll fall off the wagon as soon as March (if not sooner). And it’s not surprising, really. 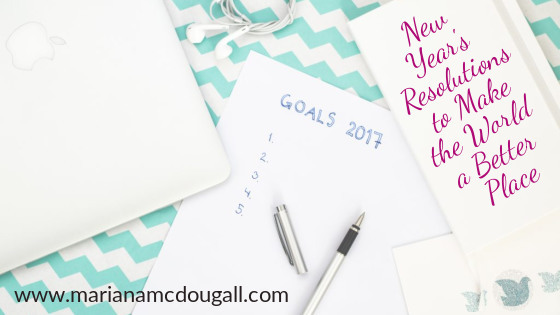 If you follow the blog, you know it’s no secret that I don’t like New Year’s Resolutions. Not just because they’re the most ineffective way to reach a goal, but also because they tend to be too near-sighted and belly-button focused. The majority of people who make New Year’s Resolutions are thinking only of themselves when they make them. Case in point: the top New Year’s Resolutions are “losing weight” and working on self-improvement. Now, don’t get me wrong. Should you need to lose weight, it’s fine to set a goal (not make a resolution) to get it done. And there’s nothing wrong with self-improvement—as a matter of fact, this blog has a heavy focus on that. But this whole business with New Year’s Resolutions is bothersome because people are trying to devote an entire year to working just on something that will benefit them and no one else—and that may be a big part of why most resolutions fail. The problem with your New Year’s Resolutions (well, one of them, anyway) is that they’re a bit too selfish. You’re only thinking of yourself. How does losing 20 lbs make the world a better place? How does you getting your finances in order make the world a better place? Whereas paying off your debts and getting organized are both worthwhile goals, they’re not enough. When you make resolutions that solely focus on you, you’re missing a very big part of the picture. We’re often quick to complain about the state of the world, but slow to take action to change it. But you should try to remember that seemingly tiny actions have a ripple effect, and small gestures can change the world. Here are 16 suggestions of New Year’s Resolutions to make the world a better place. Which one will you choose? Once you decide, don’t forget to make it into a SMART goal, and to set process goals in order to achieve it. We are too quick to see the faults in everyone but ourselves. Even when we do recognize that we have faults, we seem to forget this when we nit-pick about other people’s personalities. Nowhere is this truer than at home. How many times do we complain, nag or shake our heads at our spouse’s behaviour? Do we ever stop to think about everything we do that he/she might not like? How often do we see the negative side of a situation and focus on it, making ourselves miserable in the process? I’ts time to start seeing the positive in everyone and in every situation. Some people complain about the “silver lining” philosophy, but there is something to be said for staying positive. When you look for the good in everything, you become instantaneously happier, and happiness and enthusiasm tend to be contagious. By committing to seeing the good in everyone and everything, you can help to make the world a better place, by planting the seeds of positivity and happiness everywhere you go. Man, woman, adult or child—everyone loves a sincere compliment. Always, always, always find something to compliment, and do it early on in the conversation. When you open up a talk with a compliment, the tone is set for a friendly interaction, and you make someone a little happier. Whether it’s simply a comment on a nice piece of clothing someone is wearing, or (preferably) an action they have taken that you admire, make a commitment to tell others something good about them. When you tell others that they are wonderful, they become even more wonderful. And the world becomes a better place. How many letters of complaint have you written in your lifetime? How many letters of thank you have you written for excellent service or an excellent product? We are all so quick to complain and voice our opinion when we are displeased with a business. Yet very few of us take the time to sit down and write a personal thank you note when businesses go out of their way to make us happy. Make a commitment this year to at the very least write one letter of thanks for every letter of complaint you write (or for every product you return). When you voice your happiness because someone has gone our of their way to help you, the world becomes a better place. Whether it’s your spouse, your kids, or even your best friend, give them a hug or a kiss frequently, because we all crave human touch. This is a side of Brazil that’ll never leave my blood. I have been living in North America for 20 years, but I still hug everybody. I don’t think I’ll ever stop this, and thankfully, no one seems to mind. Make a commitment to complain less and hug more. Participate in Free Hugs Day. Be there when someone needs a hug. Kiss your kids good night every night, even if they’re already asleep. Make the world a better place by being there when someone needs a kiss or a hug. Be there. 5. Keep the earth clean. Make the world a better place this year by learning what can be recycled, composted, and what must go to the landfill, and follow those rules. Don’t throw things out your car window. Don’t “accidentally” let receipts or other papers fall out of your hand and “forget” to pick them up. Participate in pitch-in days. Teach your children to do the same. Start a worm composting farm if you live in an apartment, or a compost pile in your backyard if you live in a house (yes, you can compost organic matter in the winter!). Re-use your food scraps for composting and for making vegetable broth. Avoid throwing things away as much as possible. By doing all of these things, you’ll help to keep the planet clean and to avoid a post-apocalyptic wasteland. Recycling can be a controversial subject, but there’s no denying that re-using items is better than sending them to the landfill. Having said that, the saying “reduce, reuse, recycle” starts with “reduce” for a reason. Stop buying so much junk. Make a commitment to only buy what you need or what truly brings you joy . Consider giving experience-based gifts rather than material items. Think about what you want out of life and what legacy you want to leave behind when you’re gone. Use your money to achieve these things. If when you’re gone, you want to be remembered for your collection of expensive handbags or muscle cars, sure, spend your money on those things. But if you want to be remembered for the person you are, for your accomplishments, and for your kindness to others, re-consider how you’re spending your money—and make the earth a better place in the process. Reuse things. If you buy food in jars, wash them out and use them for storage – don’t go out and buy more plastic containers. If you buy food in plastic containers, see if you can reuse them for food or small items storage. Before throwing out worn-out clothing, see if you can use the fabric to create something new, or see if you can find someone who wants to do so. Finally, if you’ve exhausted your options with reducing and reusing, do recycle. It’s better than throwing more junk in a garbage dump. Make a commitment this year to reduce your garbage generation by at least 50%. Make it a challenge for yourself. See if you can put out just one small bag of garbage each week. Consider starting a blog to chronicle your journey. In doing so, you’ll make the earth a cleaner place, and you might inspire others to do the same. 7. Shovel snow for others. If one of your new year’s resolutions is to “get healthy,” why not be practical and helpful at the same time? Snow shovelling can be a great full-body workout (if you do it properly to avoid injury). Do you have an elderly neighbour who could use some help? Does a busy stay-at-home mom with young children live on your street? Has someone on your street recently been injured? Do you have a neighbour with a disability? Make a commitment to help out where you can this winter. Don’t just shovel your own driveway; shovel someone else’s too. Don’t have any neighbours who look like they might need help? Help them anyway. Random acts of kindness can go a long way in making the world a better place. 8. Talk to strangers (and open your home to them). Some perfect strangers we’ve hosted in our home. “Don’t talk to strangers” is a lie. And it’s a lie that needs to die. Don’t teach your children not to talk to strangers (post coming about this very soon!) Teach them how to be safe around strangers instead. Talking to strangers is fine; going with them in a car is not. Talking to strangers is fine; taking food from them is probably not. Have open conversations about why it’s not only OK, but essential to speak to strangers. After all, if you always refused to talk to strangers, you’d never have made any new friends. Talk to strangers. All the time. Open your home to them, too. Talk to strangers at the bus stop. Say hello to a stranger when you’re out for your morning walk. Help a stranger put their cart back at the grocery store. Make friends with new people in a non-structured environment. If we all start talking to each other again, perhaps we can make this world a happier place. Open your homes to strangers, too. People think my husband and I are nuts for doing this, but our crazyness affords us some amazing life experiences that we will never forget. We are members of couchsurfing.com and warmshowers.org, and have met some wonderful people and heard some amazing travel stories that we would have never had the opportunity to learn about, had we not been open to having strangers in our home. We are teaching our children by example that it’s not only OK to talk to strangers, it’s kind to help people and to have no strings attached when doing so. We are showing them that helping others simply because you want to help them is worthwhile. I encourage you to do the same. Do things for others just because. No special occasion needed. Wouldn’t it feel good to have someone do something nice for you when you weren’t expecting it? Do that for others as well. The more we help each other, the nicer this world can become. Not sure what to do as an act of kindness? There are many lists on the Internet to inspire you. Here’s one. Most of us think of far-away places when we think of hunger. But did you know that the use of Food Banks has increased drastically in the last year, both in Canada and the US? Right now, there are people in your own community who do not make enough money to purchase groceries for their family. Right now, there are people in your own community who are homeless and in need of shelter and food. Right now, there are people in your own community who need your help. There are many ways to feed the hungry. You could donate to a food bank—give money, not food. Here’s why. You could donate to a soup kitchen—again, give money, so they can stretch the dollars further and can buy what they actually need. You could make sandwiches and deliver them to the homeless in your town. You could host a fundraising dinner for your local food bank. There are also people going hungry worldwide. After you help in your own community, you could also consider helping organizations such as Plan Canada or Plan International. Look around you and see that there are people making do with almost nothing, and give what you can to help them. Make a commitment this year to help stop hunger, in your community and around the world. What causes do you feel strongly about? What outrage did you last post on social media? Take those as inspiration to get off your soap box and actually do something. Complaining doesn’t change the world. Action does. There are so many options when it comes to volunteering. You could help at a local non-profit or charitable organization, you could start a fundraising event, you could use your talents to sing or play music at a nursing home. Can’t think of a place to volunteer? Here’s some inspiration. Now go change the world. If you’re religious and you have an active prayer life, make sure that you’r’e asking favours for others before you ask them for yourself. Giving praise and thanks before asking for something is usually good practice, too. I learned the acronym ACTS for my prayer life from the book The Year of Living Biblically (which is both hilarious and thought-provoking, by the way). The author, in turn, learned the acronym from a pastor, who suggests you follow the acronym in order when you pray: Start with Acclamation (giving praise to the Lord); followed by Confession (asking for forgiveness), followed by Thanksgiving, and finish with Supplication (asking for stuff). I personally split the supplication into supplication for others and supplication for self. This keeps me humble and helps me to remember that other people need prayers, too. If you’re not religious, send positive thoughts to other people frequently, before focusing on your own inner awareness. I am seriously trying to remind myself of this every single day. As a parent, I yell far more often than I’d like. Breaking the cycle is difficult. I know that yelling doesn’t accomplish anything, and my number one goal as a mother is that my kids never be afraid of me. If you have trouble with yelling, arguing, or generally speaking angrily to loved ones, make a commitment this year to work on always speaking in a loving tone to those around you. In so doing, you’ll create better relationships in your life, and in turn, make the world a better place. If you enjoy singing, why not make the world a better place by sharing your talent? How about singing free of charge for a nursing home, a hospice, or a psychiatric hospital? A children’s event? Music brings people together. If you have a talent for music, make the world a better place by sharing that gift. So much trouble in the world could be prevented if we only learned to speak to each other with respect and to listen to each other with attentiveness. This year, make a commitment to better the world in which you live by becoming a better listener. A good listener looks at the speaker in the eyes, clears his/her mind, and forgets about what he/she wants to say. The good listener fixes all attention on the speaker, repeats the speaker’s main points back to him/her, and states their interpretation of the facts and opinions presented. The good listener offers suggestions when asked, but never attempts to immediately solve the speaker’s problems without first offering empathy and attempting to understand how the speaker feels. The good listener goes into a conversation with the speaker’s best interests at heart, and with a willingness to make compromises so both sides are satisfied. How many wars could be prevented or stopped if the leaders of the world became better listeners? How many families saved? How many friendships restored? This year, commit to becoming a better listener and to focusing on positive communication. The world will be a better place for it. Isn’t that a wonderful quote? What if every single person in the world lived by these words? What if everyone in the world tried to help their neighbour and encouraged people to achieve their dreams and become their best selves? Imagine what we could become—imagine what the world could become! Instead of making New Year’s Resolutions that will soon be forgotten, why not make a commitment to making the world a better place? You could pick one of these resolutions to accomplish each month. Forget the far-fetched “resolutions” and focus on helping others. It’ll come back to you tenfold.